Play the Coeliac UK Spring Raﬄe today and you could be a £10,000 winner! 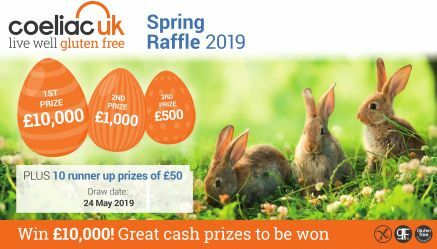 By playing our Spring Raﬄe you can help Coeliac UK change even more lives in 2019. We offer vital support services as well as undertaking research and campaigning for change to those that have to live gluten free. You are also giving yourself the chance to win an amazing £10,000 cash ﬁrst prize and with 13 cash prizes on offer, winning would surely put a spring in your step! “My granddaughter Aimee was diagnosed with coeliac disease at just 3 years old. Now, aged 7, she takes everything in her stride and that is because of the support that Coeliac UK provides to her and our family. I now support their work so that more people can beneﬁt from the vital services they provide.” Christine, Coeliac UK supporter. You could win £10,000 and help people live well, gluten free! It’s simple to enter the draw. All you need to do is click on the Play now button below. Each chance cost £1. The closing date is 22 May and the draw will be held on 24 May 2019. Don’t want to miss a Raffle? An easy and cost effective way of taking part in our raffles is joining our subscription raffle which gives you automatic entry into our 3 raffles a year. For more information please visit our How to play page. Thank you for your support and Good Luck in the draw!